4Media Video to DVD Converter is designed to convert video files in most formats (including HD, and MOV videos shot by iPhone 4 and iPhone 4S) to DVD movies and burn them onto DVD discs for enjoyment on DVD players. 4Media Video to DVD Converter is packed with features allowing you create customized DVD movies: make personalized menus; clip and crop movies; add subtitle and audio files, opening film, effects, and watermarks, among other great features. Support iPhone 4/iPhone 4s, a variety of smart phones, a variety of DV video capture and almost all popular video formats. Tailor-made for video to Home DVD conversion and Home DVD making, 4Media Video to Home DVD Converter offers the best solution to convert videos files in most formats including high-definition (HD) formats (MP4, MKV, AVI, DivX, XviD, HD camcorder videos (M2TS, MTS, TS), iPhone 4/iPhone 4S videos (MOV), MPG, MPEG, QuickTime Videos (MOV, QT), DV, VOB, Real Video (RM, RMVB), WMV, H.264/AVC, ASF, DAT, FLV, 3GP) to Home DVD movies, allowing you to burn them onto DVDs and view them on your Home DVD players. In addition to creating DVDs, 4Media Video to Home DVD Converter can also help you make ISO files and Home DVD folders for your video files. Not just the perfect Home DVD creation tool, 4Media Video to Home DVD Converter is also perfect for Home DVD movie customization: create unique Home DVD menus, clip movie segments, crop the movie frame, add multiple subtitle and audio files, insert opening film, attach watermarks, apply artistic effects, and so on. With multithreading and multi-core processing supported, 4Media Video to Home DVD Converter is guaranteed to provide you with the maximum possible video to Home DVD conversion speed. Convert video files in formats including MP4, MKV, AVI, DivX, XviD, HD camcorder videos (M2TS, MTS, TS), iPhone 4 videos (MOV), MPG, MPEG to DVD movies. Create DVDs from video files. 4Media Video to DVD Converter completes the DVD burning in multithreading and multi-core processing mode at super high speed. Add multiple number of file to convert in one conversion，greatly reducing the time to create a DVD. 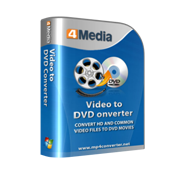 Transform video files into ISO files and DVD folders using 4Media Video to DVD Converter. This video to DVD converter allows you to create a DVD menu with personalized background music and picture, title, opening film, video thumbnails added; a selection of stunning menu templates are available. And the menu templates can be downloaded. Add subtitle (up to 32) and audio (up to 8) files to create a multilingual DVD movie; clip movie segments; crop the movie image; add personalized text and picture watermarks; apply artistic effects. This video DVD converter allows you to clip the required segments from a video then merge them together to create a new movie. Adjust the video/audio quality, bit rate, television standard, aspect ratio, resize mode, audio channel, sample rate, and other parameters to fully customize your DVD movie output. Create a DVD movie without displaying menu; the main movie will be played directly. Set an interval for adding chapters to your DVD title; chapters will be added accordingly during Video to DVD conversion. All popular DVD formats supported: DVD-R, DVD+R, DVD-RW, DVD+RW, DVD+R DL, DVD-R DL, DVD-5, DVD-9. This Video to DVD burner enables you to preview your movie with various effects and settings applied in real-time; take a snapshot of any movie image you fancy whenever you fancy. Set a “Post-Task Action” (shut down, stand by, hibernate system, exit application, do nothing) and the desired action will be automatically performed at the end of the DVD creation process. Set the video to DVD conversion and DVD creation processes to run in the background for reduced CPU usage so you can comfortably run other applications at the same time. 4Media Video to DVD Converter comes with several interface languages built-in: English, French, German, Japanese, and Chinese.